How Do Cannabis Plants Use CO2? Are You Ready to Use CO2? How can cannabis growers use CO2 to increase cannabis yields? CO2 can increase your yields and growth by up to 20%, but a lot of people use CO2 the wrong way so they aren't getting any of the benefits. Cannabis plants use CO2 when they're making energy from light, so without CO2 there's no photosynthesis or growth. However, most of the time there's already more than enough CO2 in the air for your plants. If your plant doesn't need more CO2, it won't help to add more. But things are different when your space is bright. When there's more light than a cannabis plant can naturally use, supplying more CO2 can help your plants use more of that light. Getting more energy from the same amount of light results in faster growth. 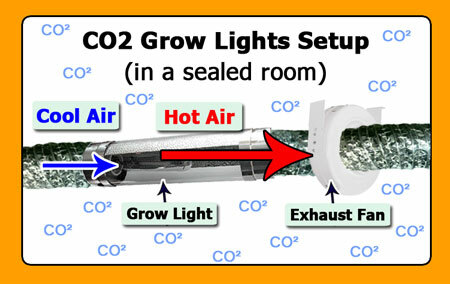 Because of how this works, CO2 only increases growth when your cannabis plants are under very bright light (like the light from a 1000W HPS). But CO2 can be expensive. So before you ever think about adding CO2, it's a good idea to have completely optimized your cannabis grow space. CO2 works best when everything else is optimal, and for most growers, a little optimization results in bigger returns than adding CO2. Only after you've dialed in all other factors of your grow is when it's time to think about adding more CO2. These things will all make a huge difference in your yields, often more than the gains you could get from CO2. ​But after all that, adding CO2 may be the logical next step to get even more from your cannabis garden. Because of all the misinformation out there, so many cannabis growers have wasted a lot of money on ineffective CO2 methods. I want to help growers understood exactly how CO2 enrichment works. That way you can set it up the right way and enjoy the benefits! After years of research and study by commercial greenhouse growers, we've learned exactly what's needed to get the benefits of extra CO2. Here are some factors to consider if CO2 will work for your cannabis garden. Bright Light - Your cannabis plants need a lot of light for CO2 to be effective at speeding up growth and increasing yields. As far as light intensity, we're talking about the kind of light produced by a 1000W HID grow light. CO2 only helps plants make more energy from bright light, so it won't help if you have low light levels. Enough CO2 - You must be able to maintain 1200-1500 PPM of CO2 in the grow area or it won't help your plants. Sealed Grow Space - You must be able to completely seal your grow space so CO2 can't get out. Temperature - You should maintain temperatures between 85°F (30°C) and 95°F (35°C) in your grow space for CO2 to be most effective. Humidity - You must keep humidity below 60-70% to prevent mold and other problems, but keeping humidity low can be difficult with a sealed room while running CO2. You may need to get a dehumidifier. I know it may sound like a lot, but these factors are important! If you have the wrong setup, adding more CO2 isn't going to help you! Today I will share everything I wish I’d known about CO2 when I started growing, so you'll know exactly how you can use CO2 for faster growth and increased marijuana yields. Let's get started! Beware! Some people (especially companies selling poor CO2 products) will try to trick you into thinking that CO2 is some magical supplement you add to your grow room to make plants grow better. Unfortunately this is not the case! There are good ways to add CO2... and there are ineffective ways. Bigger Yields, Faster Growth - If you’ve maxed out the other limiting factors (especially light), CO2 can make your plants grow up to 20% faster, produce bigger plants, and enhance your yields. Higher Temperature is Okay - Maintaining 1200-1500 PPM of CO2 in the grow area allows growers to keep temperatures much higher than normal. For growers with hot bright lights, this makes it easier to keep temps at a range their plants will like. Cost - It can be expensive to get started if you want to inject enough CO2 into your grow area to be effective. The best setups in the long run are a bit pricey to get started with, though they become a lot cheaper once you've got your initial supplies. 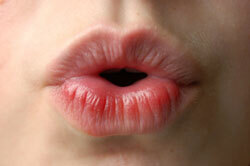 In fact, humans take in oxygen and let out carbon dioxide with every breath. Humans use their lungs to get oxygen, and in order to survive we need oxygen in the air at all times. Oxygen is delivered to our bloodstream and is needed for important body processes. Similarly, plants need CO2 during the day as part of their important life processes. Instead of lungs, plants use hundreds of tiny pores in the leaves (known as stomata) to get CO2 out of the air. Like humans with oxygen, a plant will die if it doesn't get access to any CO2, because CO2 is needed for cannabis photosynthesis, the process of making energy from light. Taking away CO2 takes away the plant's ability to "eat." Fun Fact: As a byproduct of photosynthesis, plants let out oxygen back into the air. The photosynthesis process generates most of the oxygen in our atmosphere. Without CO2 and photosynthesis, we would have no oxygen to breathe! In certain environments, indoor cannabis growers can add extra CO2 into their cannabis grow room during the light hours to increase the speed of plant growth. Therefore, flooding your grow area with CO2 during your dark period is a waste of time and money. CO2 only provides benefits when the lights are on. How does CO2 affect marijuana growth? 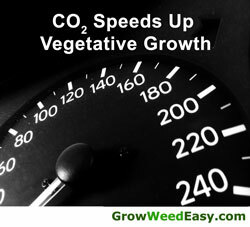 CO2 is most effective at increasing the speed of vegetative growth, so adding extra CO2 is one way to grow bigger plants in less time during marijuana’s vegetative stage of growth. When Should I Start Using CO2? You need to have maxed out on almost all other growing factors and eliminated major growing problems to see the biggest benefit from adding CO2. I’d like to point out that there are many free ways to increase your marijuana yields, such as plant training techniques, and mastering these first is going to be more effective in increasing your yields than adding CO2. If you’ve already mastered the basics of growing and have healthy plants in your garden, then training your plants properly in the vegetative stage and choosing the best grow lights you can afford are the next steps you should take to majorly improve your yields. Mastering these factors will often be more effective for increasing your yields than adding CO2. Your plants can only grow as much as allowed by the lowest limiting factor, and usually that factor is something else besides CO2. Am I willing to seal up my grow area so it’s airtight? If your answer is “Yes” to all those questions, than CO2 enrichment may be right for you and your garden. Supplementing CO2 is a great choice for those who have maxed out their other options and are willing to spend the money to do CO2 right. For these growers, supplementing with CO2 can increase the number of crops grown per year and allow them to grow bigger plants. If you’ve got a relatively big grow, the bigger yields will quickly pay for the CO2 investment. A good rule of thumb is you should have 7500-10000 lumens per sq foot in your grow area to get the full benefits of enriching with CO2. 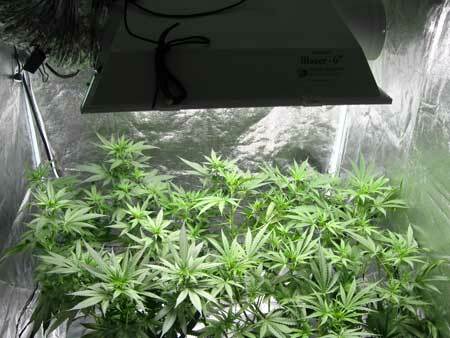 You need high-powered grow lights like HPS bulbs for this rule to hold true. To figure out if you have enough light, find out how much lumens your bulbs gives off. Then find the square footage of your space (length x width). Lumens/square footage should equal 7500-10000. 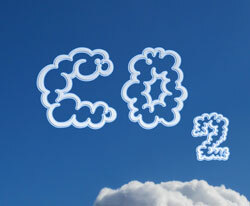 You must be able to maintain 1200-1500 PPM of CO2 in the air of your grow area for CO2 enrichment to be most effective. Regular air only has about 400 PPM of CO2. That means that in order to maintain the right amount of CO2, you need to seal your grow space so your extra CO2 stays inside. If you can’t seal your grow area so it’s airtight, then any CO2 you are adding will leak out and CO2 will return to normal levels. For the best results, you want the entire grow area to be sealed so the CO2 stays near your plants. 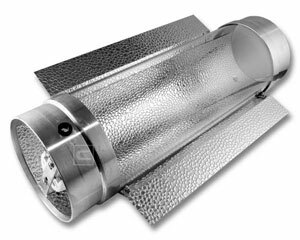 When it comes to your grow lights, a "Cool Tube" style hood is an effective reflector for your grow space. 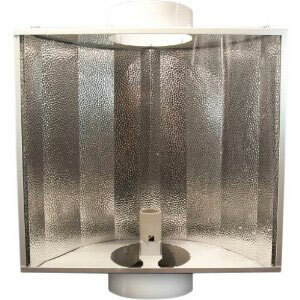 You can use ducting to bring cool air over your light from outside the grow space, then vent the hot air out without even touching the air in your grow space. 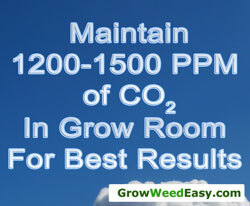 Growers seem to agree that optimal CO2 is 1200-1500 PPM in your grow room. If there’s less CO2 than that (especially under 1000 PPM), you won’t get good results with CO2 supplementation. When the CO2 drops under 300 PPM, plant growth will slow down or even stop completely. If you have a very small grow space (like the inside of a cupboard), then you may be able to maintain 1200-1500 PPM of CO2 in the area with one of the cheaper methods of CO2 enrichment since you won't need as much CO2. If you’ve got a larger grow space (such as a closet, a grow tent, or a room) it will be hard to maintain enough CO2 in the air without investing in one of the more expensive options like a CO2 generator or compressed CO2. 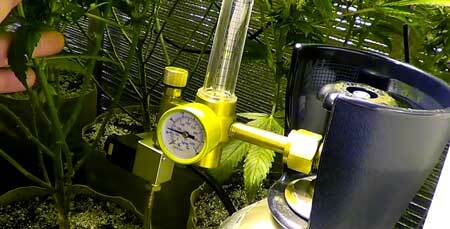 CO2 Generators and Compressed CO2 are the most effective ways to add CO2 to your grow area. I do not recommend any of the other methods. Learn why. You must maintain very high temperatures, between 85°F (30°C) and 95°F (35°C). 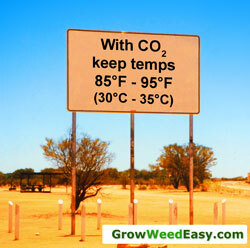 When you’re adding CO2, you will get the best results at higher temperatures. Normally you want your garden to be a comfortable room temperature, but when adding CO2, you want to keep temps above 85°F (30°C). Many growers recommend you keep temps as high as 95°F (35°C). If the temperature is lower than 85°F (30°C), you won’t see much benefit from adding CO2. CO2 should “fall” onto plants from above. CO2 is heavier than air and will sink to the bottom of your grow area, so you you want your CO2 to float down onto your plants. That means any CO2 enrichment method should be located above your plants. 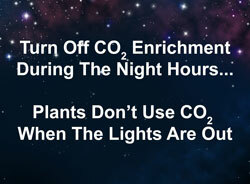 You can save money by turning off CO2 enrichment at night. Because plants actually stop "breathing in" CO2 at night, you can turn off your CO2 enrichment system when the lights go out! In fact, you can save money by having your CO2 enrichment turn on a half hour after your lights do, and turn off a half hour before your lights turn off. This will save you an hour’s worth of CO2 injection each day and in tests has proven this will not affect the CO2 effectiveness. You must have already maxed out on your grow lights (light intensity) for CO2 enrichment to be effective. A good rule of thumb is you should have 7500-10000 lumens per sq foot in your grow area to get the full benefits of enriching with CO2. To figure out if you have enough light, find out how much lumens your bulbs gives off (usually written right on the box your bulb comes in). 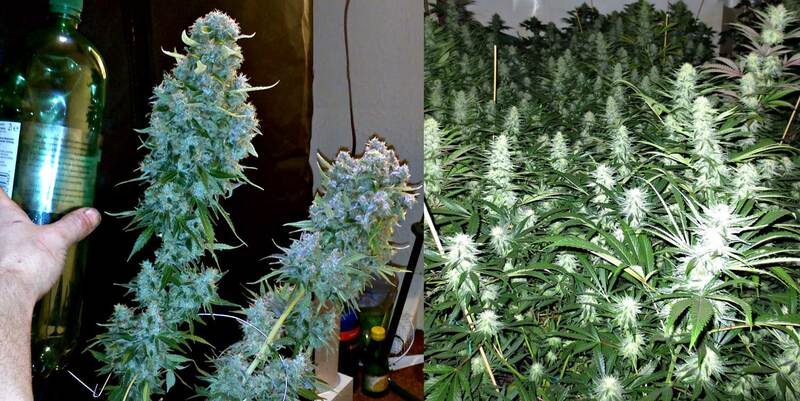 Then multiply the length x width of your grow space to find the square footage (the area). Lumens/area should equal 7500-10000. How Can I Add More CO2 To My Grow Room? Note: The cheaper methods of CO2 generation (like burning denatured alcohol in a small stove) make CO2 hard to regulate and can be very unsafe.... Don't use these methods! Only use a professional CO2 Generator! Dry Ice is made of cold, solid CO2. As it warms up, it releases that CO2 into the air. While this method can be effective in the short term, it's incredibly expensive and time-consuming to keep this method going for long. Fermentation uses natural processes to produce CO2. Unfortunately this method will almost never produce enough CO2 to be effective. Impossible to automate; even if you manually check CO2 levels and take steps on a regular basis to keep the fermentation process going, it still won't produce enough CO2. CO2 bags use mycelial mass (fungi) growing on organic matter to produce CO2. Unfortunately they won't make enough CO2 for pretty much all setups. Doesn't produce enough CO2 to be effective. Even in a very small space, growers may need to hang 4-5 or more bags (or more!) over their plants in order to achieve the right PPM in their grow area. Even then, I've never heard of any growers who use this method for long-term CO2 injection. They just don't work well enough for the price and time needed. Some growers use the composting process, which produces a small amount of CO2. Like the other "natural" CO2 enrichment tools, it just doesn't make enough CO2 to be effective. Unfortunately this just isn't going to add enough CO2 to be effective. It's good to spend time with your plants, in fact I love hanging out in the grow room. But the facts show that breathing on your plants isn't going to make them grow any faster.